J. N. Roberts, of Mattoon, spent a few days in our town last week visiting his son, J. E. Roberts. Source: Crittenden Record-Press. (Marion, Ky.) 1907-1909, January 9, 1908, Image 8 - Chronicling America - The Library of Congress. 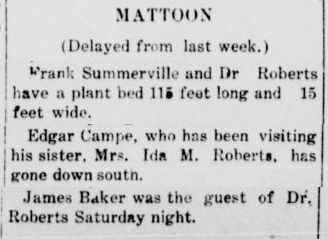 Mrs. Ida M. Roberts of Mattoon spent last week visiting her son Jno. E. Roberts of this place. Source: Crittenden Record-Press. (Marion, Ky.) 1907-1909, January 16, 1908, Image 5 - Chronicling America - The Library of Congress. Misses Vienna and Elva Roberts visited here last week. Miss Vienna will start to Anderson, Ind. this week where she will accept a position offered her by the Gospel Trumpet publishing company at that place. John E. Roberts has just received a large pair of deer horns presented to him by one of his old hunter friends, Dan Wilson, of Butler county, Mo. Source: Crittenden Record-Press. (Marion, Ky.) 1907-1909, January 30, 1908, Image 4 - Chronicling America - The Library of Congress. 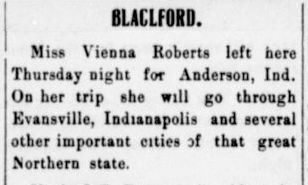 Miss Vienna Roberts left here Thursday night for Anderson, Ind. On her trip she will go through Evansville, Indianapolis and several other important cities of that great Northern state. Source: Crittenden Record-Press. (Marion, Ky.) 1907-1909, February 6, 1908, Image 5 - Chronicling America - The Library of Congress. 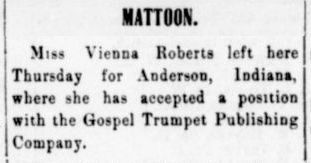 Miss Vienna Roberts left here Thursday night for Anderson, Indiana, where she has accepted a position with the Gospel Trumpet Publishing Company. Source: Crittenden Record-Press. (Marion, Ky.) 1907-1909, February 6, 1908, Image 10 - Chronicling America - The Library of Congress. The death angel visited our town last Tuesday, taking from the home of John E. and Ernestine Robert's, their only child, a sweet little girl babe, given to them only one day previous to its death. The enterment [interment] took place Wednesday in our City cemetery. Luther Clift and Owen Roberts will leave this week for Princeton, Ky., where they will enlist in the U. S. Army. We are proud of boys like those, two who are aflame with patriotism and wish them a happy life while protecting the stars and strips [stripes]. Source: Crittenden Record-Press. (Marion, Ky.) 1907-1909, February 13, 1908, Image 8 - Chronicling America - The Library of Congress. Owen Roberts, of Crittenden county, spent Saturday and Sunday in our city. Source: Crittenden Record-Press. (Marion, Ky.) 1907-1909, February 27, 1908, Image 4 - Chronicling America - The Library of Congress. John N. Roberts, of Mattoon, spent last week in our town. Source: Crittenden Record-Press. (Marion, Ky.) 1907-1909, March 5, 1908, Image 6 - Chronicling America - The Library of Congress. Lewin Roberts, of Mattoon, spent Sunday in our town. Source: Crittenden Record-Press. (Marion, Ky.) 1907-1909, March 12, 1908, Image 8 - Chronicling America - The Library of Congress. Jno. E. Roberts who has been located at Crider, Ky., as section foreman for the I. C. R. R. for some time returned home Sunday. Source: Crittenden Record-Press. (Marion, Ky.) 1907-1909, March 26, 1908, Image 5 - Chronicling America - The Library of Congress. J. N. Roberts, of Mattoon, spent Sunday here visiting his son. Source: Crittenden Record-Press. (Marion, Ky.) 1907-1909, April 9, 1908, Image 5 - Chronicling America - The Library of Congress. 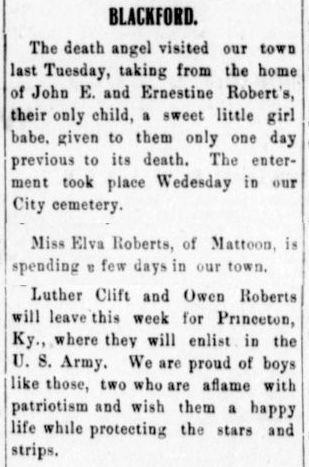 Miss Elva Roberts of Mattoon spent last week in our town visiting her brother John E. Roberts. Source: Crittenden Record-Press. (Marion, Ky.) 1907-1909, May 7, 1908, Image 2 - Chronicling America - The Library of Congress. J. N. Roberts, of Mattoon, spent Saturday in our town. Source: Crittenden Record-Press. (Marion, Ky.) 1907-1909, May 21, 1908, Image 10 - Chronicling America - The Library of Congress. Mrs. N. J. 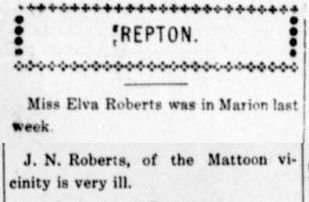 [J. N.] Roberts of Mattoon visited her son at Blackford Monday. Source: Crittenden Record-Press. (Marion, Ky.) 1907-1909, June 11, 1908, Image 8 - Chronicling America - The Library of Congress. John E. Roberts, who has been very sick with typhoid fever, is able to be on the streets again. Source: Crittenden Record-Press. (Marion, Ky.) 1907-1909, July 2, 1908, Image 5 - Chronicling America - The Library of Congress. 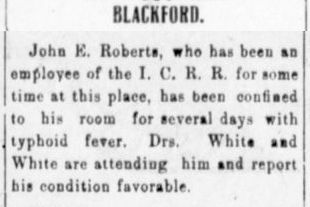 John E. Roberts, who has been an employee of the I. C. R. R. for some time at this place, has been confined to his room for several days with typhoid fever. Drs. White and White are attending him and report his condition favorable. Source: Crittenden Record-Press. (Marion, Ky.) 1907-1909, July 2, 1908, Image 7 - Chronicling America - The Library of Congress. Miss Elva Roberts will teach the Colon school. Source: Crittenden Record-Press. (Marion, Ky.) 1907-1909, July 9, 1908, Image 8 - Chronicling America - The Library of Congress. Oewn [Owen] Roberts, of Mattoon, Ky., is spending a few days in our city. 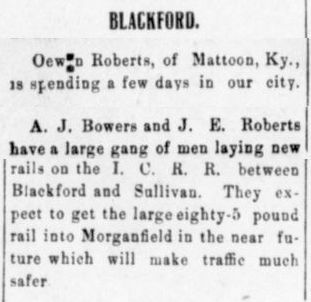 A. J. Bowers and J. E. Roberts have a large gang of men laying new rails on the I. C. R. R. between Blackford and Sullivan. They expect to get the large eighty-5 pound rail into Morganfield in the near future which will make traffic much safer. Source: Crittenden Record-Press. (Marion, Ky.) 1907-1909, July 16, 1908, Image 8 - Chronicling America - The Library of Congress. Mrs. J. M. Greer and family called on Mrs. J. E. Roberts Sunday. Source: Crittenden Record-Press. (Marion, Ky.) 1907-1909, July 23, 1908, Image 8 - Chronicling America - The Library of Congress. John Roberts is very busy with his dray wagon. Source: Crittenden Record-Press. (Marion, Ky.) 1907-1909, September 10, 1908, Image 8 - Chronicling America - The Library of Congress. Master Lewen [Lewin] Roberts, of Mattoon, Ky., visited here Sunday. Source: Crittenden Record-Press. (Marion, Ky.) 1907-1909, November 19, 1908, Image 8 - Chronicling America - The Library of Congress. "Colon Spelling Society" which organised a few weeks ago with Messrs. Herbert Phillips and Homer Hughes as leaders, has been quite interesting and beneficial. 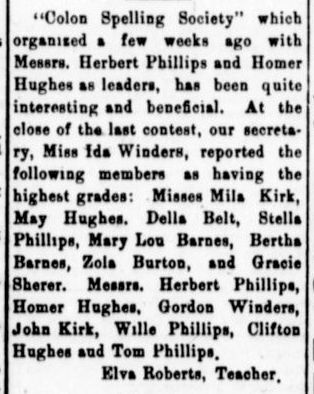 At the close of the last contest, our secretary, Miss Ida Winders, reported the following members as having the highest grades: Misses Mila Kirk, May Hughes, Della Belt, Stella Phillips, Mary Lou Barnes, Bertha Barnes, Zola Burton, and Gracie Sherer. Messrs. Herbert Phillips, Homer Hughes, Gordon Winders, John Kirk, Wille Phillips, Clifton Hughes and Tom Phillips. Source: Crittenden Record-Press. (Marion, Ky.) 1907-1909, January 14, 1909, Image 4 - Chronicling America - The Library of Congress. Miss Elva Roberts was in Marion last week. J. N. Roberts, of Mattoon vicinity is very ill. Source: Crittenden Record-Press. (Marion, Ky.) 1907-1909, June 3, 1909, Image 8 - Chronicling America - The Library of Congress. John N. Roberts was born November 7, 1843, fell asleep trusting in Jesus June 6, 1908 . In the early 70's he professed faith in Christ and was baptised by Elder Paul Walker. In 1889, under the preaching of Rev. J. J. Smith he received the blessing of full salvation. He was filled with peace, love and joy, rejoicing in God as only the true christian can. From that time he said he had no fears in death. His affliction lasted through many months, but he submitted himself to God and bore testimony to the last. He frequently spoke of his departure, and on the last sad night, calmly, as if preparing for a journey, he gave instructions concerning everything. He was conscious to the last, knew he was dying, said his time had come and he was glad to go. After telling us all good bye, giving us a parting message, telling us not to grieve, but rejoice, because all of his sufferings would be over, he breathed in his last in full hope of eternal life. Source: Crittenden Record-Press. (Marion, Ky.) 1907-1909, July 22, 1909, Image 3 - Chronicling America - The Library of Congress. Lewin Roberts, of Marion was here Tuesday. Source: Twice-A-Week Record-Press. (Marion, Ky.) 1909, August 24, 1909, Image 3 - Chronicling America - The Library of Congress. Miss Elva Roberts is teaching a successful school at this place. Source: Crittenden Record-Press. (Marion, Ky.) 1909-1918, September 23, 1909, Image 3 - Chronicling America - The Library of Congress. Miss Elva Roberts is our teacher and the school is progressing nicely. Source: Crittenden Record-Press. (Marion, Ky.) 1909-1918, October 21, 1909, Image 6 - Chronicling America - The Library of Congress. Our school is progressing nicely with Miss Elvah [Elva] Roberts as teacher. Source: Crittenden Record-Press. (Marion, Ky.) 1909-1918, November 25, 1909, Image 5 - Chronicling America - The Library of Congress. 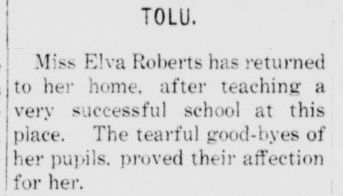 Miss Elva Roberts, the teacher of the Tolu school, passed through here Friday en-route home. Source: Crittenden Record-Press. (Marion, Ky.) 1909-1918, January 6, 1910, Image 3 - Chronicling America - The Library of Congress. Mrs. Ida M. Roberts, of near Mattoon, sent us a dollar as a new subscriber last week. Source: Crittenden Record-Press. (Marion, Ky.) 1909-1918, January 6, 1910, Edition 2, Image 5 - Chronicling America - The Library of Congress. Miss Elva Roberts has returned to her home, after teaching a very successful school at this place. The tearful good-byes of her pupils, proved their affection for her. Source: Crittenden Record-Press. (Marion, Ky.) 1909-1918, February 17, 1910, Edition 2, Image 7 - Chronicling America - The Library of Congress. Frank Summerville and Dr. Roberts have a plant bed 115 feet long and 15 feet wide. Edgar Campe [Kemp], who has been visiting his sister, Mrs. Ida M. Roberts, has gone down south. James Baker was the guest of Dr. Roberts Saturday night. Source: Crittenden Record-Press. (Marion, Ky.) 1909-1918, March 2, 1911, Edition 2, Image 2 - Chronicling America - The Library of Congress. 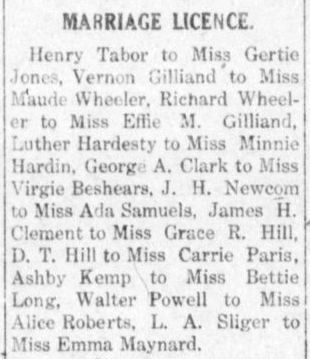 Henry Tabor to Miss Gertie Jones, Vernon Gilland to Miss Maude Wheeler, Richard Wheeler to Miss Effie M. Gilland, Luther Hardesty to Miss Minnie Hardin, George A. Clark to Miss Virgie Beshears, J. H. Newcom to Miss Ada Samuels, James H. Clement to Miss Grace R. Hill, D. T. Hill to Miss Carrie Paris, Ashby Kemp to Miss Bettie Long, Walter Powell to Miss Alice Roberts, L. A. Sigler to Miss Emma Maynard. Source: Crittenden Record-Press. (Marion, Ky.) 1909-1918, March 9, 1911, Image 7 - Chronicling America - The Library of Congress. by Mrs. Ida May Roberts. Source: Crittenden Record-Press. (Marion, Ky.) 1909-1918, March 9, 1911, Image 8 - Chronicling America - The Library of Congress. 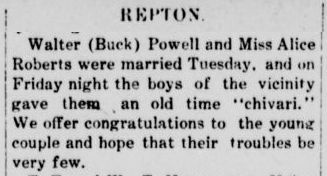 Walter (Buck) Powell and Miss Alice Roberts were married Tuesday, and on Friday night the boys of the vicinity gave them an old time "chivari." We offer congratulations to the young couple and hope that their troubles be very few. Source: Crittenden Record-Press. (Marion, Ky.) 1909-1918, March 16, 1911, Edition 2, Image 7 - Chronicling America - The Library of Congress. Frank Summerville and Dr. H. D. Roberts were in Repton Monday. Source: Crittenden Record-Press. (Marion, Ky.) 1909-1918, May 4, 1911, Edition 2, Image 3 - Chronicling America - The Library of Congress. Misses Lena Duval [Duvall] and Elva Roberts of Oklahoma, are visiting relatives and friends. Source: Crittenden Record-Press. (Marion, Ky.) 1909-1918, June 8, 1911, Edition 2, Image 8 - Chronicling America - The Library of Congress. Misses Elva Roberts, Lena And Sadie Duval [Duvall] of Mattoon section left Thursday for Oakman, Okla., where they have secured schools and will teach this fall. Source: Crittenden Record-Press. (Marion, Ky.) 1909-1918, September 7, 1911, Image 10 - Chronicling America - The Library of Congress. Mrs. Ida M. Roberts and son, Lewin of Mattoon were in the city Friday shopping. Source: Crittenden Record-Press. (Marion, Ky.) 1909-1918, October 19, 1911, Edition 2, Image 5 - Chronicling America - The Library of Congress. Mrs. Ida M. Roberts and son, Lewin, have returned from a ten days' visit to her son, John E. Roberts, at Providence. Source: Crittenden Record-Press. (Marion, Ky.) 1909-1918, November 16, 1911, Image 4 - Chronicling America - The Library of Congress. 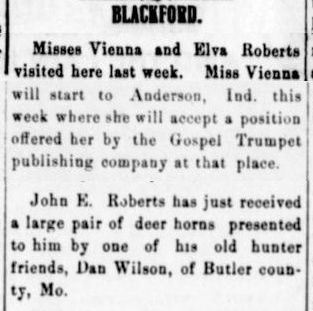 Miss Vienna Roberts was married at Murphysboro, Ills., Dec. 3rd, 1911 to Edward H. Harding. The bride is well known to portions of this county having been born and raised here. She taught four schools here, but feeling a call to gospel work, she resigned that profession, and for over a year has been in active, public service for the Master. During this time, she has traveled in West Virginia, Kentucky, Illinois, Missouri and Ohio, and has preached to hundreds, and the power of God is with her, and the beautiful saintly life that she lives every day, is enough to convince men the gainsayer, that her mission is divine. The groom is also a young minister, a fine singer and musician. Immediately after the ceremony the couple left for Hickman, Ky., the home of Mr. Hardings parents, where they expect to spend a few days, and then go forth again in gospel work. May success and happiness attend them. Source: Crittenden Record-Press. (Marion, Ky.) 1909-1918, December 21, 1911, Image 1 - Chronicling America - The Library of Congress.